(BPT) - No wonder you’re thinking of selling your home - it’s a “seller’s market” right now. The housing supply has dwindled, creating more demand for fewer homes. At the same time, according to Realtor Tammy Reinke, buyers’ expectations are higher than ever. They’ve become accustomed to model-perfect homes. What’s the upshot? “Sellers have a choice,” says Reinke. “You can win the price war - or win the beauty contest.” By winning the beauty contest, you’ll gain pricing leverage. And if your home shows well, it can even spark a bidding war - generating offers that exceed your asking price. Here are three top “beauty” tips to set your home apart from other contestants, and set yourself up for a fatter settlement check. Stained carpets should be cleaned or replaced. Stained ceilings deserve your attention, too. They can scare off prospective buyers who fear that ceiling imperfections might be a sign of bigger problems. “If you’ve got a stained popcorn ceiling, don't bother trying to spot paint over it, it doesn’t work,” Reinke says. Even professionals find it difficult to match the original finish and color. In addition, flocked or heavily textured ceilings are best replaced because they look so outdated. Instead, consider installing ceiling tiles or panels directly over the offending ceiling, using a simple DIY track-and-clip system. To weigh all your ceiling replacement options, pop some real popcorn and settle back with the Armstrong Ceiling video guide to ceilings for lots of ideas and inspiration. Buyers can’t picture themselves in your home if they can’t see past your piles of stuff. “There’s a difference between clutter and an intentional collection,” says Tiffany Little, a senior interior design at Albion Associates. So you’ve cleaned and decluttered, but now your rooms seem blah and uninviting. Nothing enlivens a space like a splash of color. Toss some bright new pillows on the sofa or add tasteful artwork or accessories to complement your color scheme. Paint adds personality, too, but choose your colors carefully so your wall palette flows naturally from room to room. “I like using a neutral color palette for larger rooms - from ivory tones to values of grey,” says Little. She adds mid-tone colors to smaller rooms, while selectively using vivid or deeper colors as accents with accessories and artwork throughout the home. Finally, don’t forget to add texture, whether with a woven area rug or sculptural wire baskets. “Texture adds great dimension and depth to a room,” says Little. 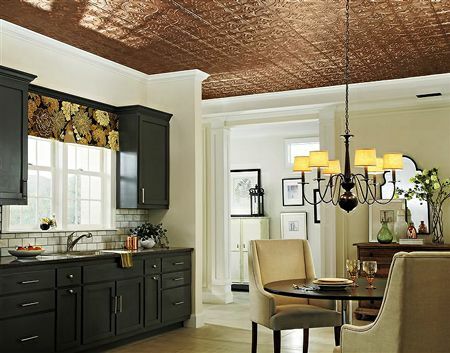 “I especially love the look of Armstrong Ceilings decorative metal ceiling panels in textured tin or copper as accents above a kitchen island. 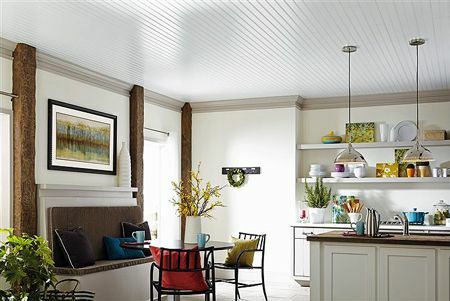 This turns the ordinary, smooth sheetrock ceiling into a wow factor. By adding this textured ceiling color in with a few of the dishes, or countertop items, it unifies the room’s palette,” she added. With a bit of primping, your home can win the ultimate beauty contest and attract a buyer who’s willing to meet your price, or even pay a premium to call it their own.